And even though some were finally ripe, it was taking me a while to get out there to harvest. You see, I’m used to late tomatoes. For some reason, mine always seem to ripen at a snail’s pace while my friends have long since “put up” their season’s best. And after several years of home gardening, I’ve learned that lateness is one thing I can count on with my beefsteaks, romas and cherry berries. But, long before my tomatoes were ripe, I heard that his wife was busily canning and putting up loads of spaghetti sauce. I jokingly told her that I’d be doing the same … in about a month. Recently, I was at my friend’s house and he showed me a table full of ripe tomatoes – offering them to me. He said that his tomatoes were being so slow that they went out and bought bushels of tomatoes for their canning. Now that they were done, their tomato crop decided to show up! Something similar happened to Sarah. After hearing that she and her husband Abraham were going to have a child in their old age, Sarah waited… and waited. And then she waited so more. Finally, Sarah felt that she had waited enough. And she came up with a plan that would bring her husband a son a whole lot quicker. She took herself out of the equation and provided Abraham with a “substitute wife” (see Genesis 16). But Sarah’s plan wasn’t God’s plan was it? God wanted the promised child to come from Sarah’s womb. And Sarah would just have to wait. Does Sarah’s “waiting game” sound familiar to you? I know it does for me. Sometimes I want to “help” God along in answering my prayers and sometimes, I just want to quit. Florence Chadwick was the first woman to swim the English Channel in both directions. And in 1952, she set out on another long distance trek swimming from Catalina Island toward the California coast. It was a 26 mile swim in numbing cold water. But thick fog had set in and Chadwick, after 15 hours of swimming, asked to be taken out of the water. The shoreline was close, she was told, but, because of the fog, she couldn’t see it and gave up. Chadwick later found out that she was just a half mile from shore. And she told reporters that if she could have just seen land, she might have been able to keep on going. 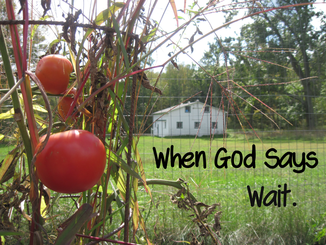 Waiting on God is a lot like that sometimes isn’t it? God doesn’t always give us the “inside scoop” on how and when he is going to answer our prayers. And when we can’t see clearly how things are going to turn out, we are tempted to give up like Florence Chadwick. Are you in a “holding pattern”right now? God’s saying wait and you’re wondering how long? Be careful not to move forward on your own or even quit without prayerful consideration. Sometimes things, like ripe tomatoes, take time. But I am like a green olive tree in the house of God; I trust in the mercy of God forever and ever. I will praise You forever, Because You have done it; And in the presence of Your saints I will wait on Your name, for it is good. My soul, wait silently for God alone, For my expectation is from Him. He only is my rock and my salvation; He is my defense; I shall not be moved. I wait for the Lord, my soul waits, and in his word I put my hope. My soul waits for the Lord more than watchmen wait for the morning, more than watchmen wait for the morning.